We've been hearing all kinds about NVIDIA's Tegra the last couple weeks, and have all been quietly wishing and hoping that we'd see Android getting some action -- and we will, and how! 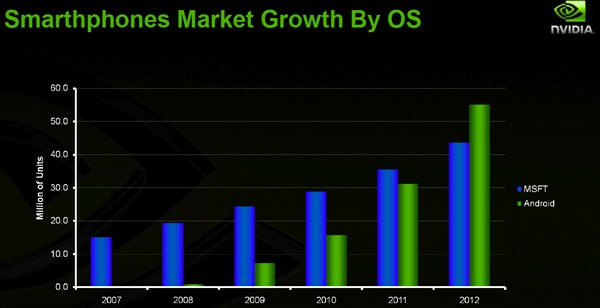 Apparently while the initial focus is Windows Mobile, NVIDIA sees Android surpassing Windows Mobile sales into 2012 and has decided to put some serious grunt into the new OS's development. 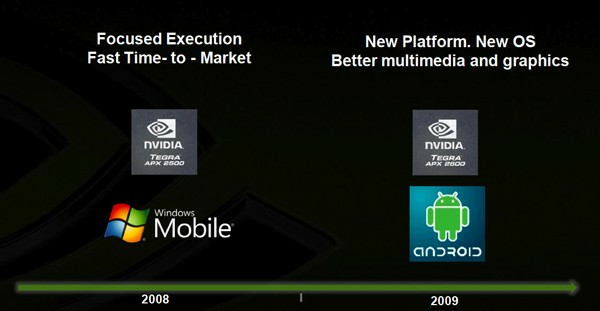 The NVIDIA Tegra 2600 part is being developed with an optimized and accelerated Android release aimed squarely at OEM development and set for release sometime in Q2 this year. We've no idea how long it takes from reference to finished-in-our-hands-product, but the briefing hints at a couple mystereious sets, the "IAC S2" in Q3 and a "Yulong N8" by Q4. This guy is under glass over at NVIDIA's H.Q. here at MWC, so expect more once we stroll over for a look-see. Few more pics after the break.